The Amazon Echo Show, a touchscreen version of Amazon Echo featuring Alexa, is now shipping in the UK. The Echo Show is currently available to buy from Amazon for the price of £200. A pre-order launch deal is also currently being run where if you buy two Echo Show at once you save £100 on the total cost. To claim this deal you need to enter the code "Show2Pack" at checkout. What can the Echo Show do over the standard Echo? Well, headline features include the ability to act as a digital photo frame, with the Echo Show pulling any pictures stored on a user's Prime Photos account, showing a song's lyrics on screen when a track is being played with Amazon Music, relaying video feeds from any connected security cameras, and in what will no doubt be the biggest sell to many, access to video and voice calls. 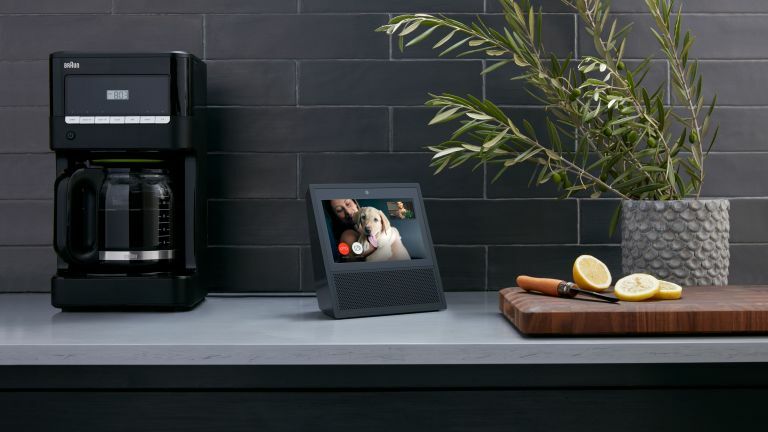 With Amazon Echo Show anyone can make or receive calls through the device providing that they have the Alexa app installed, with a new feature called "Drop In" allowing designated friends and family to make a call at any time even on a friend's system. Asides from the new 7-inch touchscreen, technically the device is largely similar to the Amazon Echo, however, the Echo Show has eight microphones instead of 7, as well as a pair of two-inch speakers in the bottom frame and a five-megapixel front-facing camera.